I found this Nissan Sentra on Craigslist this morning. Everything looked good and it was being sold at the Lithia dealer on South Broadway. That's where I bought my work truck I've been very satisfied with. I've always felt Lithia was careful to sell quality used cars, if they were to sell them at all. At least from my prior experience. I wanted to make sure they were open so went to their web site and found they had one of those live chat apps to talk to a representative. I gave that a try. Clicked on a link and a chat window opened. Before I could do anything some guy types "Good morning. How can we help you". That was fast. I ask him if the Nissan Sentra was still available. He says to hold while he goes to check. He comes back and says it is and asks if I wanted to make an appointment to look at the car. I told him I didn't want to make an appointment but we'd come by sometime within the next couple hours. He gets my name and phone number then tells me he'll let the sales guys know and to tell the front desk who I am when I get there. We get down there a bit before noon. Some guy was out placing flags advertising sales. Turned out he was the sales manager. We asked him about the Nissan Sentra. He's not sure if it's still there and goes inside to check. He comes out and said it had been sold at the end of the previous day. Figures (I had a feeling that online guy wasn't local). We tell him we're looking for something like that- smaller and good on gas. He asks us to wait for a minute while he goes to find a regular sales guy. The sales guy comes out, his name was "Toppy". Pleasant fellow with the gift of gab. By that, I mean someone that seems to know how to easily talk to people. They don't have a whole lot of used cars but the ones they do have are nice, as I expected, but a bit out of our price range and large for my tastes but, hey, this isn't about me. Connie seems slightly interested in a black Chevy Cruze. I'm not happy with a black car but didn't say anything. 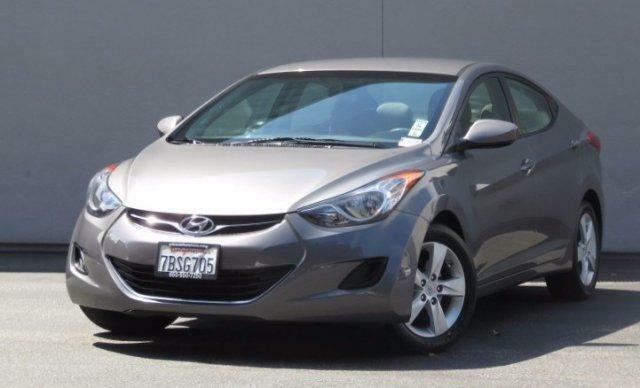 We kept going back to a 2013 Hyundai Elantra- kind of a mix between gray and blue (picture isn't the same color). It was over what I wanted to pay, but the guy suggested the price wasn't set in stone. It wasn't really that expensive considering the year and miles- just over 30k miles- but that's because it was a former rental car. I have no problem with rentals. I forget exactly, but I think they were asking a bit over $13k. After all would be said and done, that would probably be $15k or more, but that was probably the best we could do there. If nothing else, though, I really do trust that they try to sell quality used cars. I mentioned to the guy my concern was mostly monthly payments. I didn't want to pay over $200.00, although I knew that was asking a bit much. I finally suggest Connie take a drive in it. We get in, drive to Herrick Avenue and back. During the short drive, I reiterated to the guy monthly payments were my main concern. He confirmed $200 was a bit low to expect, but he'd see what he could do. We get back and he invites us inside to figure out the financial details. I know where this is going so reminded him we didn't say we were going to buy the car. It depended on what kind of deal we could get. He said he understood. Here we go! I know I'm about to buy a car. My resistance was low, anyway. I wanted to get this car buying thing over with. I was stressed and had the beginnings of a headache the whole time. The sales guy takes all our info. Checks our credit, insurance and all sorts of other stuff. Then he starts rattling off sales points about warranties for various things that I'm thinking will cost extra, but I don't really recall him mentioning costs. He probably did. He's just good at slipping that stuff in low key. I'd agreed somewhere along the line that $250 monthly payments would be acceptable. He got it close to that at $271, or thereabouts. Then he started going though various figures and all sorts of paperwork. I wasn't just burned out at that point, I was fried. Finally after an hour or more, at some point I said, fine, let's do it. We signed some more papers and I thought that was it. Nope. He says to hold on and we had to go somewhere else to finalize the deal. Ugh! The sales manager, the first guy we saw when we arrived, comes out and introduces himself. He asks us to go to his office where he's got a stack of papers to sign. Here we go again! It seemed like an hour just going through all that paperwork, signing or initialing this and that. That's when I got to actually see some of the stuff I let slip through because of my weakened state: Some free oil change deal that cost a thousand or more dollars. Some free dent repair thing good for 100k miles or some such, and something else that escapes me now. As best I could see, that added $3000, more or less, than I had originally hoped for, although I know they always slip in costs. Oh well. I wasn't going to argue about it that late in the game and, for the condition of the car, it would be nice to have some "free" dent repair. The oil change thing you're actually paying for, although I'd prefer to pay as we go than up front. Oh well. After close to 2 1/2 hours, a new car. Bigger than I would have liked, but otherwise very nice- almost too nice. At least the car buying headache is over and we actually have a car I wouldn't feel uncomfortable driving to San Francisco. Had we bought some of the older, used cars we'd seen at other dealers, I probably wouldn't feel that way. Anybody interested in a '95 Geo Metro in very rough shape? Addendum: Our bum nephew has asked to buy the Metro for $100. SOLD, assuming things work out. The rest of you, post your offers here. Happened to drive by this afternoon (before I saw this) and saw the new wheels. Night.and day with the Metro parked behind. Looks good but think you might have caved a little too quickly. "Looks good but think you might have caved a little too quickly." Probably. I wish I was in better mental shape at the time so I could have kept up with the details. Particularly those warranty things. I'm going to have to take a look at those papers we signed to see if I saw what I thought I was seeing when we were signing everything. I'm pretty sure I can go back and cancel those warranties. Libertarians & LGBT Alliance: What's Next?